This is a hardy lentil stew. 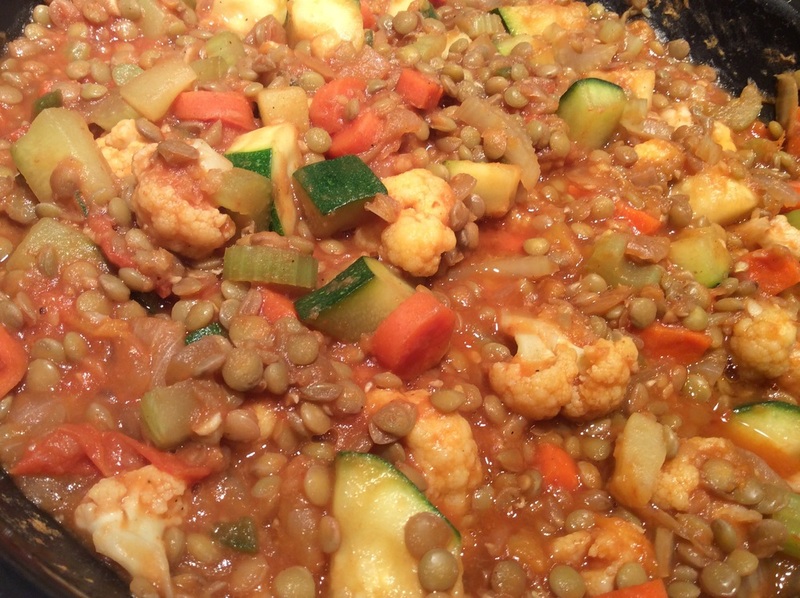 It can be vegan or not, depending on whether you use water or veggie or chicken stock to cook the lentils. Use whatever vegetables you like. Nearly anything pairs well with lentils. This recipe should serve 3-4 hungry folks. Combine the lentils and pinch of salt and and 3 cups of water or stock in a pot and bring to a boil. Turn the heat down to simmer, partially cover and cook for 20-30 minutes until the lentils are al dente. If they get mushy, you've gone too far. While the lentils are cooking, saute the carrots in a saucepan on medium heat in a tablespoon of olive oil for a few minutes, then add the onion and garlic and continue cooking for another few minutes. This is a good place to add a pinch or two of salt and some ground pepper. Add the cauliflower and cook until the carrots have softened and the onions are translucent. If the mixture is too dry, add another tablespoon of olive oil. Smoky paprika is a nice addition at this point, but not essential. Add the jalapeno, celery, zucchini and tomato. If using fresh tomato, continue cooking another five minutes or so until the tomato breaks down. If using canned tomato, just cook a until the mixture is warm. Adjust the cooking times, depending on what veggies you're using. The idea is to have a variety of different textures. That's why I add the celery near the end so there's still crunch to it when you're done with the dish. Once the veggie mixture is done, drain the lentils, but save the cooking liquid. Add the drained lentils to the veggie mixture and stir to combine on low heat. You can add some of the reserved lentil cooking liquid, but not so much that you make a soup. Taste and adjust the seasonings. It you like, you can also add a couple of tablespoons of tomato paste to make the dish even hardier. Entirely up to you. Grated Parmesan cheese is a wonderful topping to the dish. That's it. The whole thing will take about half an hour. Leftovers are great the next day and may taste even better than the first time around. Enjoy.